A winning technology could prevent up to 100 gigatons (GT) of CO2-equivalent emissions by 2050, and put the world on a pathway to mitigate up to 0.5˚C of warming by 2100. Ministry of Science & Technology, Government of India, announced the launch of The Global Cooling Prize on November 12, 2018. It is an international competition to incentivize the development of a residential cooling technology that will have at least five times (5x) less climate impact than the standard Room Air Conditioning (RAC) units sold today. 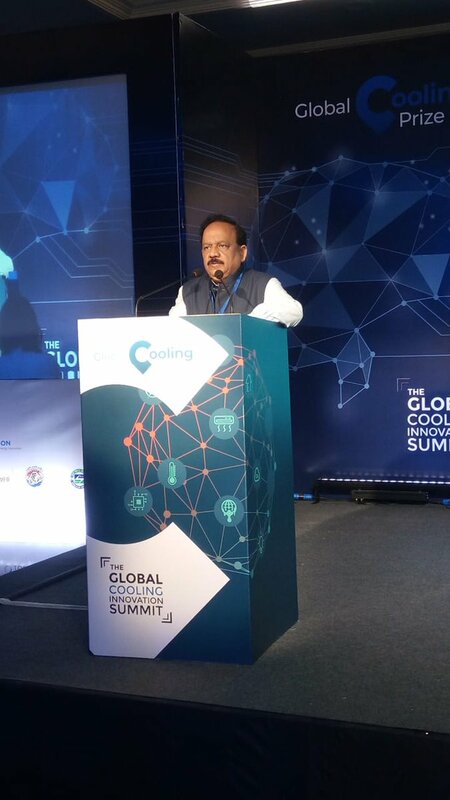 The announcement was made by Dr. Harsh Vardhan, Union Minister of Science, Technology& Earth Sciences, Environment, Forests and Climate Change at the inaugural of the Global Cooling Innovation Summit in New Delhi. “The health and productivity of billions of citizens living in tropical and subtropical climates will be affected by rising temperatures. The Government of India supports this innovation challenge, which aims to develop sustainable and efficient technology to provide thermal comfort to all, and invites applicants from around the world to apply for The Global Cooling Prize,” Dr Harsh Vardhan, Union Cabinet Minister of Science, Technology & Earth Sciences and Environment, Forests and Climate Change, Govt. of India, said in his inaugural address. “I urge innovators to rise to this global challenge to develop a super efficient technology, which provides access to affordable cooling to people around the world. India has always been at the frontiers of global innovation and now we must work together to mitigate the risks of global warming that will follow the massive deployment of ACs in the near future,” he added. There are currently 1.2 billion room air conditioning units in service around the world. It is estimated that the number of units will increase to at least 4.5 billion by 2050. India alone will see over 1 billion air conditioning deployed in the market by 2050. The energy consumption associated with comfort cooling represents one of the largest end-use risks to the climate, putting the most vulnerable populations at risk. The prize is supported by Mission Innovation, the Government of India through the Department of Science and Technology and its partner organizations namely Ministry of Power, Bureau of Energy Efficiency, and Ministry of Environment, Forests and Climate Change and will be administered by a coalition of leading research institutes—Rocky Mountain Institute (RMI), Conservation X Labs, the Alliance for an Energy Efficient Economy (AEEE), and CEPT University. The coalition will drive and support incubation, commercialization, and ultimately mass adoption of the breakthrough technology, starting in India and expanding to other countries around the world. Over US$3 million will be awarded in prize money over the course of the two-year competition. Up to 10 short-listed competing technologies will be awarded up to US$200,000 each in intermediate prizes to support the design and prototype development of their innovative residential cooling technology designs. The winning technology will be awarded at least US$1 million to support its incubation and early-stage commercialization. The summit also saw the release of a report, ‘Solving the Global Cooling Challenge’. The report, written by Rocky Mountain Institute, states that warming global temperatures, population growth, rising incomes, and urbanization will lead to an astounding five-fold increase in energy demand for room air conditioners in non-OECD countries. The report provides a call to action for a breakthrough innovation to solve the cooling challenge and finds that in conjunction with supportive long-term policy measures, would lead to a reduction in cooling-related energy consumption and refrigerant emissions sufficient to effectively offset the increase in cooling demand in the developing world.